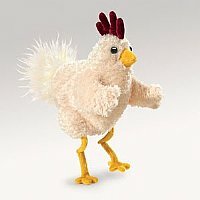 Shake your tail feathers with the whimsical FUNKY CHICKEN hand puppet! This groovy gal has feather soft plush, playful eyes and velvety comb atop her cute little head. Animate the head and wings to enliven this gregarious bird for pecking and flapping fun!